Counoise (pronounced koon-wahz) is a black grape variety that not all that many people, barring wine geeks, are familiar with. It's possible that it was brought to France from Spain but its home has become southern France where it's planted in Rhone, Provence and the Languedoc. It's one of the grapes allowed to be blended into Châteauneuf-du-Pape. Today it's also grown in California, and as a blender its acidity and fruit complements the state's bold Syrah very well. According to Craveyon, the hot Cali region of Paso Robles is the perfect place to make Counoise as its own varietal. It's a screw top. 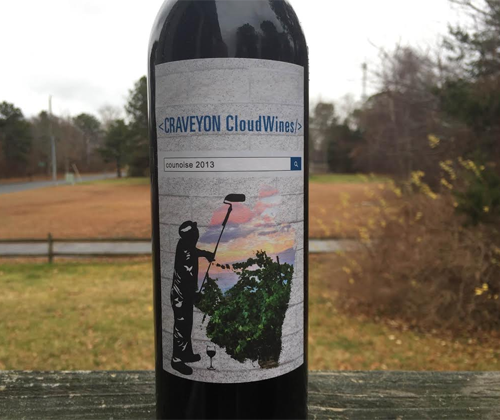 The label is web themed on the top with an HTML tag for the winery and a search box for the varietal and vintage. There's bricks as the background and on the bottom some dude is roller-painting a vineyard. The back label descriptions look like the search results. It says that the wine has a 14.9% ABV. The wine is a very transparent, stunning ruby red. 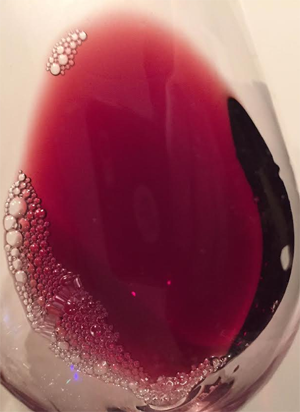 Very rarely do I sit there and just admire the color of a red wine (it happens very often with white wine) but I did it with this one. Anise and licorice are the undeniably dominant aromas on the nose. Past that there's cherries and milk chocolate. I love the nose. It's admittedly simple yet still captivating to me. The midpalate is leathery and rustic, light to medium bodied with medium to high acidity. The anise, licorice and cherries return for the finish. This isn't a complex wine that makes you think and savor every sip. Instead it's a character wine that makes you just smile and enjoy, without complaint. For $13 I really do think that this is something you should try. It's exactly what you want in quality for that price range but, being Counoise, a completely new experience in your adventures of wine. The bottle used was provided free of charge for the purpose of this unpaid review. To have your wine reviewed follow this link. You're right this is a great wine. Great review Thank you! Glad you liked the review! Thanks for the compliment and for commenting!